Tickets are $25 and include BBQ dinner. Candidate/Issue Booths: $150 after June 30, 2018. Contact Amber at 863-293-2138 to reserve your candidate booth. Enjoy live music from Polkweed Muzique! 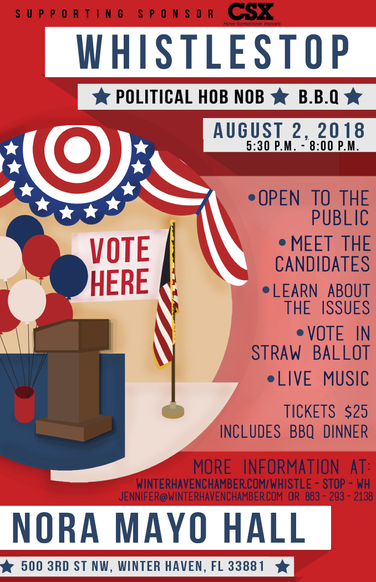 WhistleStop Winter Haven is a political hob nob and BBQ designed to acquaint the community with those running for elected office. This event is open to the public. For more information contact Jennifer@winterhavenchamber.com or call 863-293-2138. For sponsorship information contact Amanda at amanda@winterhavenchamber.com. Contact Amanda for more information on sponsorships.